Emboss two small flowers on pink cardstock and cut them out close to the embossing. Cut one butterfly from dark pink cardstock. 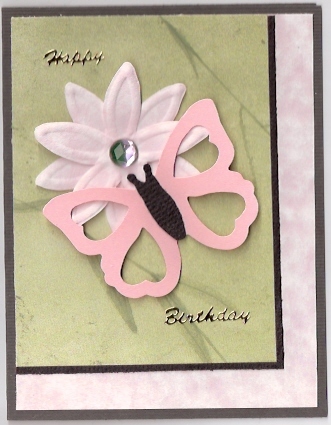 Cut one butterfly body from black cardstock and glue it to the pink butterfly. Cut a 3 1/2" x 4 5/8" rectangle from green leaf-print paper. Cut a 3 5/8" x 4 3/4" rectangle from black paper or cardstock. Cut a 4" x 5 1/4" rectangle from pink cardstock_. Layer the rectangles as shown, add flowers, rhinestone, butterfly and sentiment.